I continue to be blown away by the food experiences we are getting outside of the traditional restaurant. Today was a typical day. We started with a "stand up" breakfast of cappucino, expresso, and pastries which takes all of five minutes and blows away anything in New York. If I could eat breakfast this way every day on the way to work, I’d be a caffiene addict for sure. I may be anyway by the time we get back on New Year’s day. We stopped at a mozzerella bar called Obika for lunch. This place is to mozzerella what Nobu is to sushi. We tried mozzerella five different ways, one for each of us. Each one was better than the next. Someone should bring this concept to NYC. I am sure it would work there. 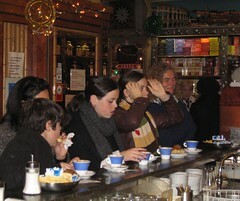 And then we made sure to get our daily fix of San Crispino in the middle of the afternoon. Josh and I went there yesterday and the whole family went there today. 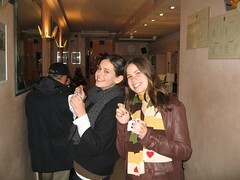 Best gelato I’ve had in Italy yet. Josh had honey yesterday and zabaione today. I had pistacchio yesterday and cinnamon and ginger (one flavor not two) today. Jessica had banana and I think that may be the best flavor of them all. Good thing we walked from our hotel to Galleria Borghese and back, then all over the place this afternoon. Gotta work off all these calories somehow.